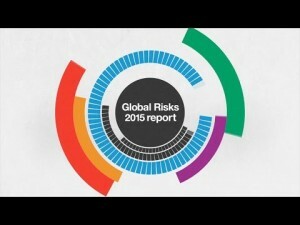 The latest Global Risks Report has been revealed. 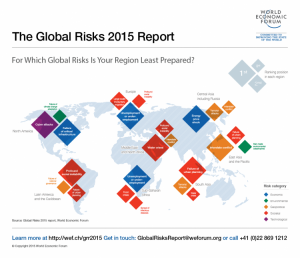 The report gives a comprehensive look of a decade of long-term risks around the world. This edition is especially helpful because it takes one step further – highlight potential causes as well as their solutions. Singapore, like other countries encounter risks and it is important that we know what they are. The 2015 Global Risks Report identifies traditional categories to include economic, environmental, geopolitical, societal and technological. The strategic partners of the Global Risks Report 2015 are Marsh & McLennan Companies and Zurich Insurance Group. The advisers include National University of Singapore, University of Pennsylvania’s Wharton Risk Management and Decision Processes Center and the University of Oxford’s Martin School. The source of their study is based on the Global Risks Perception Survey in 2014 by the World Economic Forum. 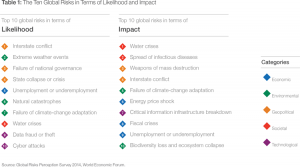 The global risks are divided into two categories – likelihood and the impact. This year, in terms of likelihood, the report states five top global risks to include interstate conflict with regional consequences, extreme weather events, failure of national governance, state collapse or crisis and the high structural unemployment or underemployment. In terms of impact, there are also top five global risks to include water crises, rapid and massive spread of infectious diseases, weapons of mass destruction, interstate conflict with regional consequences and failure of climate-change adaptation. Furthermore, the report also revealed global risks of utmost concern for the next eighteen months and ten years. These risks are divided according to categories. The utmost concerns for the next months under geopolitical risks include interstate conflict, state collapse or crisis, failure of national governance, terrorist attacks and weapons of mass destructions. Under societal risks, the utmost concerns for the next months include water crises, profound social instability, spread of infectious diseases, food crises, large-scale involuntary migration and failure of urban planning. Under economic risks, the utmost concerns for the next months include unemployment or underemployment, fiscal crises, asset bubbly, failure of financial mechanism or institution, energy price shock, deflation, failure of critical infrastructure and unmanageable inflation. Under the environmental risks, the utmost concerns for the next months include extreme weather events, failure of climate-change adaptation, natural catastrophes, biodiversity loss and ecosystem collapse and man-made environmental catastrophes. Lastly, the technological risks with utmost concerns for the next months include cyber-attacks, data fraud or theft, misuse of technologies and critical information. Knowing these things, the government now has a better idea of the risks and think of better solutions when they hit the economy.